Steve’s post reflects a critical and timely need at the TTC… for a formal written strategic plan to lay out all the many operating and capital priorities—not only to prevent Staff from burning out executing all their competing and sometimes conflicting priorities… but so that the BAC, Council, Province and Feds can plan operating and capital funding on a systematic, disciplined and transparent manner. The TTC is now a $1.1B+ annual operation, by far Toronto’s largest ABC by annual cash flow (TPS is largest budget expense item but the TTC takes in almost $800M in revenue). As bright as the current TTC Vision is… thanks to an enlightened pro-transit Mayor and transit-dependent TTC Chair (dubbed the “Boy Wonder” in the Friday Toronto Star~actually by BAC Chair Shelley Carroll); the TTC must commit to professional strategic planning, in addition to their legendarily detailed annual Operating & Capital Budgets—that simply overwhelm most TTC Commissioners, BAC members and Councillors. At the Provincial level, all Crown Boards are required to submit a 3-year strategic plan to their respective Minister. Transportation Minister Jim Bradley was the previously the Minister of Tourism and took a very keen interest in the Metro Toronto Convention Centre’s Board Governance, Strategic Plan and Annual Operating Plan. As a 4-year member of the MTCC Board, I can’t imagine Minister Bradley will not requiring the TTC and ultimately Metrolinx to also produce 3-year strategic plans (e.g. initial Regional Transportation Plan) to help the Province budget for their on-going transit investments. Steve has pithily detailed the complexity and consequences of the lack of a TTC Strat Plan. What the Mayor and TTC Chair may give up in control and flexibility by publishing a TTC Strategic Plan will be more than made up for in transparency, public (and hopefully political) understanding and support and may potentially seize the initiative away from the Metrolinx and MTO on GTA fare, farecard and transit integration which will have a dramatic impact on TTC riders. 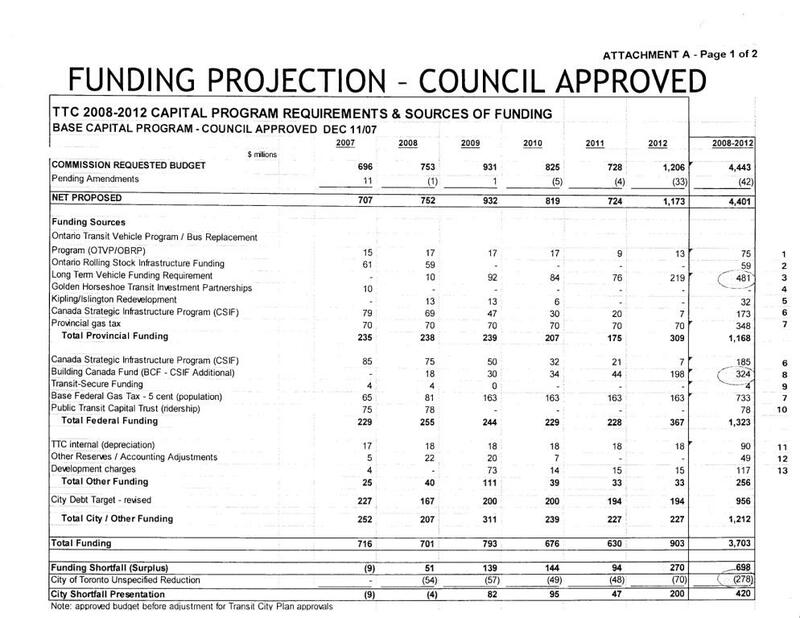 Steve: What is really ironic is that the City is supposed to be moving to multi-year budgeting. However, the only real impact this seems to be having is that budgets get locked down even earlier than before, and once set are very hard to change. This can be a recipe for paralysis if it’s not properly handled. For example, what do we do when riding goes up and we have not budgeted for the infrastructure or the operational resources to handle it because we didn’t want to make the numbers in “out years” in the budget look bad? I was just reading that the province wants to expand GO service east of Oshawa. I’m assuming at this point in time that means bus service, right? Two things pertaining to GO that I’ve been wondering about are whether the Barrie rail service is ever going to penetrate Barrie any further than it presently does and when full Lakeshore GO rail service is ever going to extend beyond Aldershot into Hamilton. And what’s this I’ve been seeing about a VIA/GO gateway to Niagara Falls? I thought James Street station was done as a rail station for all eternity. With the former TH&B station serving GO buses and trains all this time I tend to wonder what in the name of William Davis the future of GO and VIA holds for Hamilton. Steve: The Bowmanville extension is the rail service. Buses go there already. As for Barrie, there has been some nattering about extending into Barrie proper, but nothing definite yet. In Hamilton, yes there are plans to revamp and reactivate James Street Station. Although it’s a bit more out of the way than Hunter Street, it does not suffer the problems of freight congestion on the CPR approach to Hunter Street, and it opens the possibility of service beyond Hamilton. The reason all those trains stop at Aldershot (including some of those that are scheduled to go to Hamilton) is that the CPR doesn’t provide a guaranteed clear track into Hamilton from Bayview Junction. First, John Cartwright, President of the Toronto Labour Council was allowed a Board exception to make the first Metrolinx deputation. * He criticized PPP in general and the London subway tunnel PPP fiasco in particular. He indicated that Britain’s Professional Accounting body announced that henceforth all PPP will have to be declared up front as public debt~on the books~not just when the PPP goes into default. Infrastructure Ontario then presented the process for evaluating future (Transit) Capital Projects as submitted to them by Metrolinx (virtually as submitted by individual transit properties). N.B. The Province requires PPP (private-public-partnership and all its variants) evaluation a prerequisite for their funding all transit projects. It is also a hot button for Federal Finance Minister Jim Flaherty. Mayor Miller and TTC Chair Giambrone asked several pointed questions about the cost and benefits of such PPP’s. Infrastructure Ontario didn’t have one example, beyond Vancouver’s Canada line (Airport to Downtown RT) of a North American transit PPP. The Mayor and TTC Chair wanted to know why given the claimed “benefits” of PPP, had all NA transit systems (save Translink’s Canada Line) chosen to built the RT expansions themselves? Listening to IO answers was like watching lambs being taken to slaughter. In conversation after the meeting I was told that PPP’s are being pushed by David Caplan’s Infrastructure Ministry… one reason being the ability to keep the project off the public accounts, which the British Accounting Regulatory body has seen the wisdom of withdrawing. *A by-law allowing public deputations is in the works~Chair Rob MacIssac mentioned they didn’t want public deputations taking over the agenda “Or we’ll never get out of here…” So Metrolinx Board, like GO Board Meetings remain a bit of a country club atmosphere with very limited public input, especially compared to TTC Commission meetings. Steve: Some day, accounting standards in Canada will change to outlaw the off-books shenanigans involved in many alternative financing schemes. PPP is a recipe for private consortiums to feed at the public trough at little or no risk while a vital public service is compromised. As for deputations, Metrolinx may have to learn the hard way. TTC used to only allow the press, no public, into its meetings until someone actually read the Municipal Act. Back in the summer of 1972, a neighbourhood group climbed the stairs up to the 7th floor boardroom at 1900 Yonge demanding to present their request for a bus on Jones Avenue. Public agencies take security more seriously these days, but it only takes a few public disputes where a board appears to be ignoring a valid request for the political optics to be untenable. It’s a shame that Rob and the boys want to go home early and not listen to deps all afternoon. They seem to forget who they are ultimately working for. It puzzles me that GO are proposing a stop at Bowmanville when VIA pass every morning and obviously feel it’s not stopping. At what point does this become like the “just one more stop” phenomenon you have remarked on previously? There are few examples of PPPs in NA but many in the rest of the world, especially Asia (e.g Hong Kong and I believe Tokyo). They can, if properly structured with true risk sharing, offer the chance to switch some of the huge up front capital costs to operating for transit. A private sector consortium could, on the basis of a long term contract, borrow the money and build a subway or light rail line (operated under contract with the transit authority – with state of good repair/maintenance/performance specs the responsibility of the private owner). In the case of the Spadina extension, instead of having to come up with $2 billion upfront, the government(s) could instead pay ~$100 million or so for 25 years, and then own it at the end. Yes, overall it would cost a bit more, but that is like saying its cheaper to buy a house with cash than get a mortgage. Some of the risk would need to be reflected on the government books, but not necessarily all of it. The net net is that the public only model has resulted in a whole lot of nothing getting built here, and as both public and private sector get more experience, this model could gain legs. If it works for airport, roads, high speed rail and transit all over the world (where they’re actually building these things), if may be worth a second look; if nothing else it offers the potential to “test” the marketplace and understand what really has a viable business case and what is a potential political boondoggle, which we do have a lot of experience with! Steve: The single biggest problem with PPP’s is that in this part of the world at least, “private sector involvement” usually means a sweetheart deal where little or no real risk accrues to the private partner. If we structure contracts to really hold them to penalties, we spend more of our time litigating contract performance than running good service. In the end, worst case, the private “partner” walks away scot free. Perish the thought they would endanger their dividends with genuine risk. Where does all this leave the Walmart Subway? Is it definately funded or is there still hope? Steve: If by this you mean the Toronto-York Spadina extension, yes, all the money’s in the bank for that one. Such are the wonders of project-based funding. The government is quite capable of borrowing money for large upfront cost, and at lower interest rates then the private sector and without cost of private sector profit. The only reason we don’t is political fear of over spending and debt, so the propose the PPP to pay the private sector to hide the debt. It’s totally ridiculous. What exactly is the status on this? According to the February report on the project’s site, “A contract to relocate a storm sewer on Steeles Avenue that conflicts with the future Steeles West Station was tendered in early January and is expected to be awarded by the Commission on February 27, 2008.” Was this awarded and has construction begun? Under the terms of the provincial trust, construction must have begun March 23, 2008. Steve: The contract was awarded on February 27 as per this report. With regard to PPP and other variations on the theme (like 407/ETR) in our neck of the woods, we should always keep in mind that in North America we graduate more lawyers and accountants every year than we do civil engineers. We’ve also had a significant drop in those graduating from the “skilled trades” like electricians, welders, tool and die makers and machinists. There’s plenty of people around to litigate and count the dough but no where near enough to build the things we want. Steve: To which my reply simply is that we need to avoid spending a lot of money (and scarce resources of whatever kind) overbuilding our infrastructure. Right now, there is almost a feeding frenzy among those who would see us expand subways everywhere whether we need them or not. It’s good for the construction industry, but we wind up with far less transit at the end of the day. Moreover, subways support a very different built form of neighbourhoods than any kind of surface transit. I hope that we don’t wake up one day and find we’ve blown several billion on one or two lines, and the political focus has moved to some other portfolio. This has happened before, twice in the time I have been active as a transit advocate.